Be compliant with the new law. 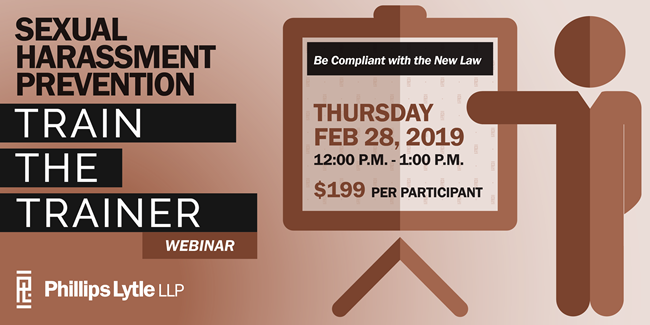 This webinar will provide the tools – policy, training materials and invaluable tips – to conduct harassment prevention training of all employees as required by the NY Labor Law and guidance. This training is essential to protect your organization and management team from liability from #MeToo and related claims. Payable by check or credit card. Please contact Stephanie Caluori with any questions at scaluori@phillipslytle.com or (716) 847-8322. I consent to retain Phillips Lytle LLP for the limited purpose of this Train the Trainer Webinar for a flat fee of $199. I also agree to the limitations** of access, use and distribution of webinar materials. ** By registering for this webinar, you agree to access, use and display this webinar on a single computer only, and to download and print copies of the webinar’s written materials only for noncommercial, informational or personal use, without modification or alteration in any way. You further agree that you may not otherwise reproduce, sell, publish, distribute, transmit, modify, display or provide the webinar or the webinar’s written materials to any third party without Phillips Lytle’s prior written permission.